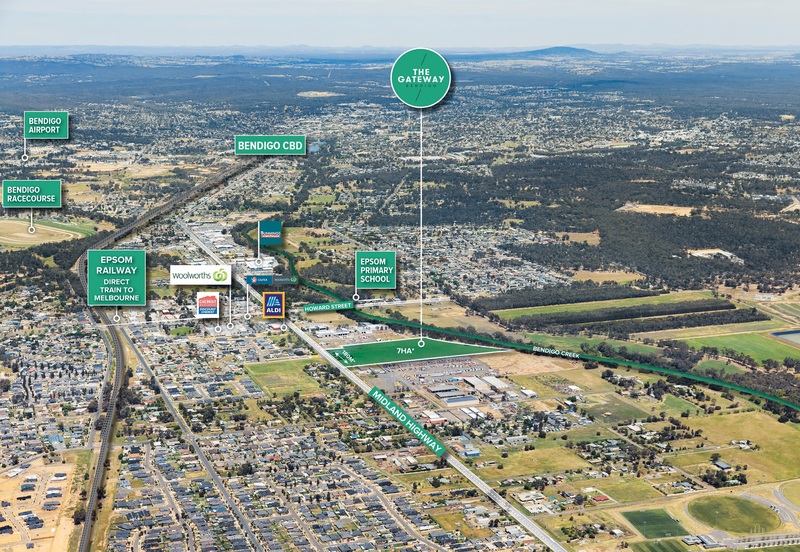 Opportunity beckons in Bendigo with Gateway sale | Commo. The listing of a seven-hectare site within Bendigo by Killen Thomas has come a month before Qantas start flying directly to the region from Sydney. An aerial view of the Gateway. The site is positioned along the Midland Highway. Victorian agency Killen Thomas is offering a 'gateway' into Bendigo's bright future as a regional hub with its latest listing. Spanning seven hectares with 180 metres of highway frontage, the Gateway represents one of the last remaining parcels of industrial land available along the Midland Highway in Epsom. The suburb recently welcomed a new shopping precinct anchored by Woolworths, Chemist Warehouse and Aldi, as well as newly initiated Bunnings Warehouse. Selling agent David Marks told WILLIAMS MEDIA the site's position in the "growth area" of Bendigo meant it lent itself to variety of industrial and retail uses. "The frontage onto the highway is fitted to semi-retail enterprises such as large showrooms, service stations and smaller format supermarkets ," he said. "The industrial blocks of land out the back could house a range of different businesses. "Epsom is where all the new homes are being built, and there is now room for companies to open up second stores to service the growth area like Bunnings have done." Such is Bendigo's potential for growth that Qantas announced it would be connecting the regional city with Sydney in the form of regular flights between the two destinations. From 31 March 2019, QantasLink will operate flights six days per week with its 50-seat Q300 turboprop aircraft, offering more than 30,000 seats on the route each year. Flights will increase to daily over the peak summer season. The launch of the services follow runway upgrades completed at Bendigo Airport last year. Mr Marks said the service would help businesses in the area expand their reach. "It potentially opens up Bendigo to the rest of Australia and possibly in the future direct freight flights into the growing Asian markets," he said. "There is a whole range of businesses that could experience growth as a result of the flights. "I think it's something potential buyers could be thinking about when looking at a property like the Gateway." The Gateway is located at 223-237 Midland Highway, Bendigo. Expressions of interest close on March 14.